As I sit typing this, if I look up from my screen my focus shifts to a print of a little red-haired girl standing in a beam of light, looking up in wonder at a glowing Red Tree in her bedroom. 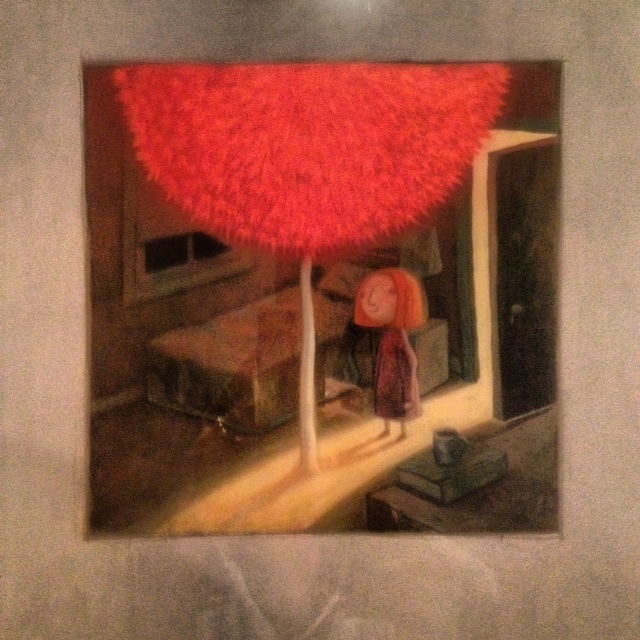 For those of you who know the book, it is the final image from Shaun Tan’s masterpiece The Red Tree. I have bought and given away that book more often than I can remember. I think it is the most precious and extraordinary story I know. And it is a story told without words. It is all Mr Tan’s incredible images – and heart. This is my image, bought at one of those times in my life when I was earning nothing and had no prospects, but knew immediately that Shaun Tan’s work would give me hope. The ghost in the image is the photographer. It was either me or the flash! When I went to record my interview with John Safran and Father Bob, I was already nervous. Mates had told me that I finally had cred because I was going on their show. That I had to lift my game to talk to them. That John was cooler than Melbourne in autumn and Father Bob was the man. I didn’t need to be told, but the stakes got lifted anyway! Then I discovered Shaun Tan was also a guest. I don’t think I can explain to you exactly how much it meant to me that I might finally be able to tell him what his book has given me over the years, or how it has become my talisman against darkness, or that I have given it to children and grown-ups and for happiness and sadness and grief and joy. Humble, smiling, surprised and kind. 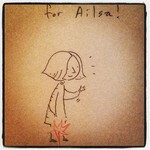 He not only signed the book to me, but he did me my own little drawing in the front of it. See? I could never have imagined I would get to meet him. I will always keep this copy of the book. A miracle. For which I give thanks. Please don’t forget that if you would like to receive these posts as twice-weekly emails, just enter your email address on the right up above, and click submit. I own another image from that same book … it’s wondrous. And life is full of unexpected joys, which is what his books reinforce. As does yours! Oh thanks! I love his willingness to take us down very deep and dark – and to insist gently that adults and children can read the same books. That they need not be categorised as one or the other. Sonya Hartnett does a similar thing with words. Greetings from the Pilgrims’ Office in Santiago, the very place where you received the Compostela at the end of the journey you so eloquently described in your recent radio broadcast. I came across a reference to it on a pilgrim forum and decided to listen for a bit. Just a bit mind you because the internet is full of sincerely expressed words and images of the pilgrimages of thousands of pilgrims and it isn’t possible to watch or listen to all of them. Instead of just a bit I was drawn into your deeply powerful, insightful and inspiring description of the camino experience. I loved the poetry of course. Who could not? But the poems were made all the more potent by your own honest words about pain and feelings, sin and healing. As if her blisters had healed and she was able to walk on, your friend got her man. I could go on but all I can say is thank you from me and on behalf of your countless sister and brother pilgrims for having the words to say what we want to. Thank you. Gracias. Muchas gracias. I took heart from your posts on pilgrim forums before I first walked the Francés, so your appreciation is a special gift for me. It’s made even more potent because I can imagine you there in that office, in that city of magical grey stone, surrounded by pilgrims celebrating and resting and calling to each other, the sound of “Buen camino” ringing off the cobblestones and into the Galician air. I love it that you heard my words in Santiago. And I am so grateful that you have written to tell me. Isn’t it mysterious, the pilgrim call? And isn’t it such a gift? Thanks again for your lovely words. May I pass them on to the producers of the programme. It will mean a great deal to them, too.